Two recipes inspired me to make a rainy night “stew” Jamie Oliver and Leite’s Culinaria beef and Guinness pie, probably equally good if you follow the directions, but missing an element or two from each recipe, I improvised taking advantage of both recipes. Neither recipe called for potatoes, but 4 Yukon gold potatoes were screaming to be let out of the potato crock so I washed and cubed them and tossed them in the last 20 minutes of oven time before the final baking. I was out of canned diced tomatoes from Leite’s recipe and I much preferred the oven method from Jaime’s recipe so I jumped back and forth between the recipes adding mushrooms from the one, cheddar from the other, and opted for store-bought pastry of course. This pie is a real winner! As it uses store-bought puff pastry, pretty quick to prepare, and you can make the filling the day before if you want. 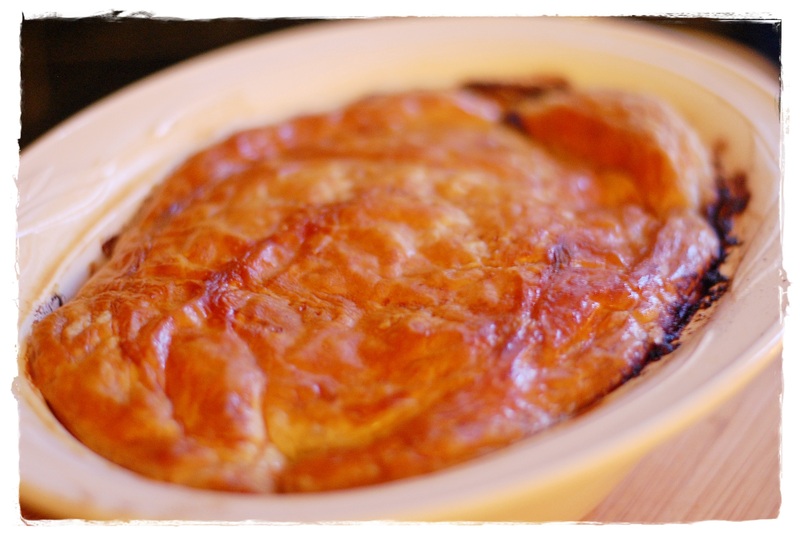 For a bit of a treat you could use 500g of pastry and line the bottom of the pie dish – just make sure you cook it at the bottom of the oven so the pastry has a chance to crisp up. Preheat the oven to 375ºF. In a large ovenproof pan, heat a lug of olive oil on a low heat. Add the onions and fry gently for about 10 minutes – try not to color them too much. Turn the heat up, add the garlic, carrots and celery and scatter in the mushrooms. 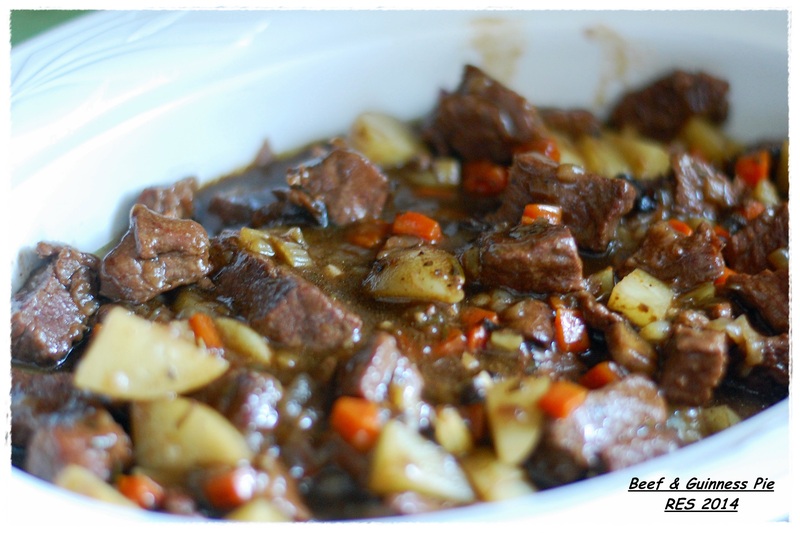 Mix everything together before stirring in the beef, rosemary, a pinch of salt and a level teaspoon of pepper. Fry fast for 3 or 4 minutes, then pour in the Guinness, stir in the flour and add just enough water to cover. Bring to a simmer, cover the pan with a lid and place in the preheated oven for about 1½ hours. Remove the pan from the oven and give the stew a stir. Put it back into the oven and continue to cook it for another hour or until the meat is very tender and the stew is rich, dark and thick. A perfect pie filling needs to be robust, so if it’s still quite liquid, place the pan on the hob and reduce until the sauce thickens. Remove from the heat and stir in half the cheese, then season carefully and leave to cool slightly. Dust a clean work surface with flour and roll the pastry out evenly with a floured rolling-pin to the thickness of a pound coin. Tip the stew into your dish and even it out before sprinkling over the remaining cheese. Place the pastry over the top of the pie dish and criss-cross it lightly with a sharp knife. Brush the top with beaten egg, and then bake the pie directly on the bottom of the oven for 45 minutes, until the pastry is cooked, puffed and golden. Delicious served simply with peas.